Yeah, but: Make everything as simple as possible, but not simpler. 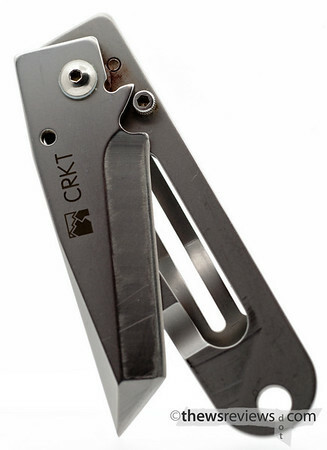 The Long Version: CRKT - Columbia River Knife and Tool - is a company that I like. They make decent products very well, and they're not too expensive. They're also quite an innovative company, and have a lot of blade shapes that I haven't seen elsewhere. I do give them a lot of credit for being a little edgy and experimental. But when things all look pretty similar, it's usually because it works. The KISS knife is designed to be as simple as possible. Its short blade has a single-sided chisel grind, with the chisel-front "tanto" point. 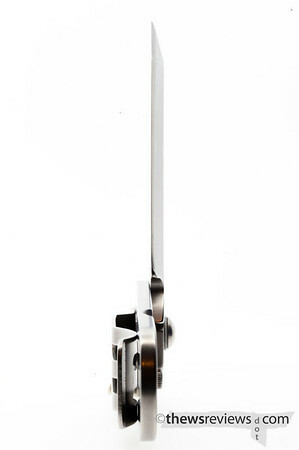 When closed the sharp edge is held safely against the handle, and when it's open the frame itself forms the lock. It has a pocket clip and a thumb stud for one-handed opening. Honouring its desire for simplicity, I've actually taken the stud off and just use the really, really steep grind on the blade for an opening surface. The stud caught on my pocket too easily, and I don't miss it at all. But here's the problem: the steep chisel grind doesn't work very well. The blade is too thick to slice through cardboard easily, and when it does, it drifts. For anything heavier than breaking packing tape, it wouldn't be what I reach for. The knife is neat, clever, and pretty; it's spawned a lot of spin-offs and imitators, but it's not a great working tool. It serves as a backup and lives in one of my T2 bags in case I forget one of my CS Voyagers, but that's about it.